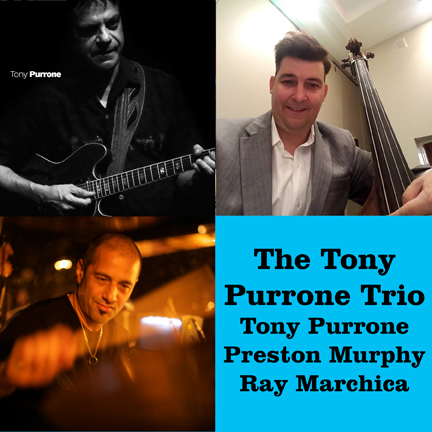 The Tony Purrone Trio plays Best Video Performance Space Friday, July 20. The show starts at 8 PM and the cover is $10. 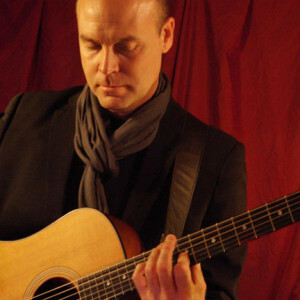 Music: Bluegrass guitar whiz Tim O’Brien to play two sold-out shows Wed. & Thurs. 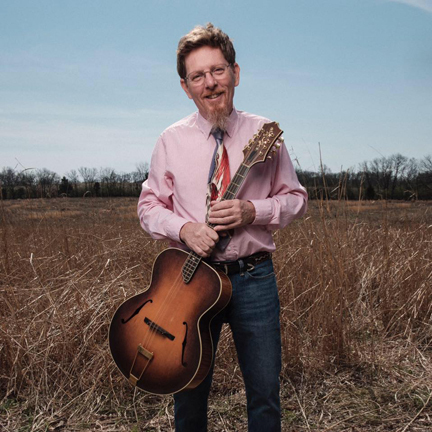 GuitarTownCT Concert Series presents bluegrass guitar star Tim O’Brien for two sold-out shows at Best Video Performance Space on Wednesday and Thursday, Nov. 15-16. The shows start at 7 PM. Born in Wheeling, West Virginia on March 16, 1954, Tim O’Brien grew up singing in church and in school, and started playing folk and rock music on guitar at age 12. After seeing Doc Watson on TV, he became a lifelong devotee of old time and bluegrass music. He started making his living as a musician at age 19 in Chicago and in Jackson, Wyoming, eventually relocating to Boulder, Colorado in the fall of 1974. O’Brien found work there as a fiddler with local bluegrass bands and as a member of the Ophelia Swing, recording with them and with Pete Wernick in 1977. In those early Colorado years, he started playing the mandolin, and studied guitar and music theory with local jazz great Dale Bruning. In 1978, Tim co-founded the bluegrass group Hot Rize with Pete Wernick, Charles Sawtelle, and Nick Forster. Hot Rize and Western Swing alter-egos Red Knuckles and the Trailblazers eventually recorded ten albums and toured the US, Europe, Japan, and Australia. The group was named Entertainer of the Year 1990 by the International Bluegrass Music Association, and their “Colleen Malone” was named IBMA’s Song of the Year in 1991. He won IBMA’s Male Vocalist of the year in 1993, and again in 2005, when he also won song of the year for “Look Down That Lonesome Road”. Solo recordings started with 1982’s “Hard Year Blues”, and other projects included three duet albums with his sister Mollie O’Brien. Folks in Nashville started noticing Tim’s songs, and he had top ten country hits in 1989 and 1990 with Kathy Mattea’s versions of Hot Rize songs “Walk The Way The Wind Blows” and “Untold Stories”. Other notable covers by New Grass Revival, Nickel Creek, Garth Brooks, and the Dixie Chicks followed. Hot Rize went dormant in the spring of 1990, after which O’Brien performed and recorded on his own, eventually releasing fourteen solo recordings, as well as collaborations with Dirk Powell (“Songs From The Mountain”) and with Darrell Scott (“Real Time”). Landmarks solo releases include a Grammy nominated set of bluegrass Dylan covers – “Red On Blonde”, the Celtic/Appalachian fusion of “The Crossing”, and 2005’s Grammy winning “Fiddler’s Green”. Tim toured and recorded with Steve Earle’s Bluegrass Dukes in the early 2000’s, and with Mark Knopfler in 2009 and 2010. Other recent collaborations include another CD with Darrell Scott (“Memories and Moments”), a track with Steve Martin (“Daddy Played The Banjo”), a family band set of Roger Miller songs (“Reincarnation”), and the reunited Hot Rize’s “When I’m Free”. A collaboration with Jerry Douglas, Shawn Camp and others -“The Earls Of Leicester” – won a Grammy as well as IBMA’s Record of the Year in 2015. Tim has produced recordings for Laurie Lewis, the Yonder Mountain String Band, the Infamous Stringdusters, Old Man Luedecke, and early mentor J.D. Hutchison. He has recorded and performed with The Chieftains, Joan Baez, Dierks Bentley, Bill Frisell, and the Wheeling Symphony Orchestra. He contributed to the movie soundtrack of “O Brother, Where Art Thou?” as well as those of “Cold Mountain”, and “The Blob”. He is a former president of the International Bluegrass Music Association, and currently serves on the board of the West Virginia Music Hall of Fame. O’Brien formed his own record label, Howdy Skies Records, in 1999, and in 2015 launched the digital download label Short Order Sessions (SOS) with his partner Jan Fabricius. SOS releases a new track every month. He has two sons, Jackson (34) and Joel (26), and has lived in Nashville since 1996. Hobbies include cooking, skiing, and playing traditional Irish music. Tim’s latest release, 2017’s “Where the River Meets the Road, is O’Brien’s 16th solo recording. Focusing on the music of his native West Virginia, it features songs by Billy Edd Wheeler, Bill Withers, Hazel Dickens, and two O’Brien originals, as well as traditional material by the Lilly Brothers, the Lonesome Pine Fiddlers, and Doc Williams. Guests include Stuart Duncan, Kathy Mattea, Chris Stapleton, Bryan Sutton, and Jan Fabricius. Best Video Performance Space presents a rare Monday music show on Mar. 28 when a couple of out-of-state guitarists drop by the room for sets. 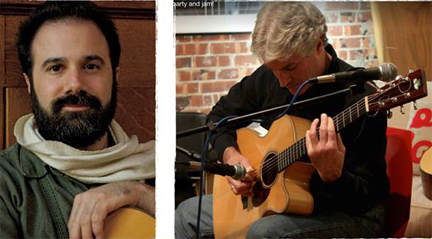 Easthampton, MA-based guitarist Trevor Healy—with Jason Labbe accompanying him on drums—and Oakland, CA-based guitarist Chuck Johnson play at 8 PM. The cover is $5. Trevor Healy is accompanied by Jason Labbe on drums. They will perform various pieces from their 15-year history playing together, focusing on songs from Healy’s recently finished album of instrumentals. 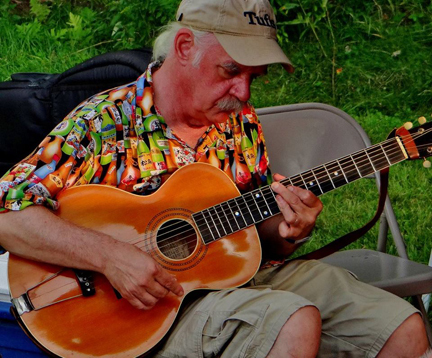 Healy is a luthier and guitarist based in Easthampton, MA. A life-long musician, he has also devoted his life to instrument making since graduating from the Roberto-Venn School of Luthiery in 1999. He went on to work with guitar maker Roger Sadowsky in Brooklyn, NY and in the repair shop of Gary Brawer in San Francisco, CA. Through these experiences, Healy gained the knowledge and skills necessary to start his own shop. In 2011 he founded Healy Guitars and now builds his own line of acoustic and electric guitars, and performs all types of repair work for local and touring musicians. Healy came up playing Irish music at a local pub with his parents. His father was his first guitar teacher and introduced him to DADGAD tuning. 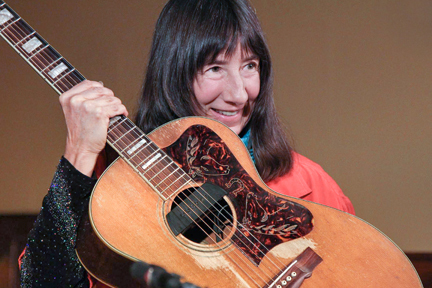 Healy went on to study classical guitar at Skidmore College with Joel Brown. 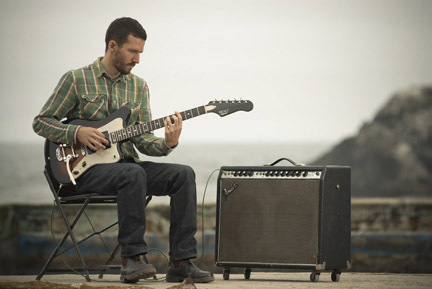 Healy’s varied influences include Fugazi, Lou Harrison, Ravi Shankar, and John Fahey. During his time in San Francisco, he was one half of the duo Meridians, which employed intricate electric, acoustic, and 12-string guitar melodies over pulsing loops of flute, violin, found objects and oscillators. 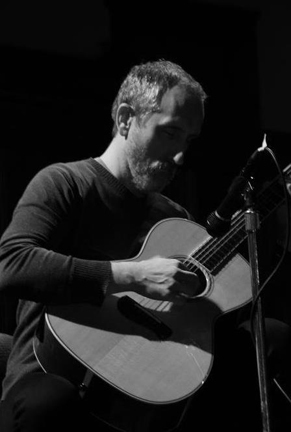 In 2010, his track “Wrapped in Water” was included on the Tompkins Square release “Beyond Berkeley Guitar”, a collection of music from Bay Area fingerstyle guitarists compiled by Sean Smith. Healy recently recorded a collection of solo compositions to be released later this year. The music is performed on 6 and 12 string guitars that he made. Chuck Johnson is a composer and musician residing in Oakland, CA. He approaches his work with an ear towards finding faults and instabilities that might reveal latent beauty, with a focus on guitar, experimental electronics, and minimalist composition. Recordings of his work have been published by Strange Attractors Audio House, Communion, Amish, Merge, Umbrella, Phaserprone, Squealer and Three Lobed. Johnson has performed with Eugene Chadbourne, Frank Gratkowsi, Peter Kowald, Miya Masaoka, and Pauline Oliveros, among others. He has performed at the Hopscotch Music Festival (Raleigh, NC), Debacle Fest (Seattle), the San Francisco Electronic Music Festival, Siren Fest (New York), BENT (New York), theFestival of New American Music (Sacramento), Music for People and Thingamajigs (San Francisco), and the San Francisco International Film Festival. Johnson’s credits as a film composer include scores for the HBO documentary Private Violence and the popular PBS show A Chef’s Life. In 2009 he received an MFA in Electronic Music and Intermedia Art from Mills College. 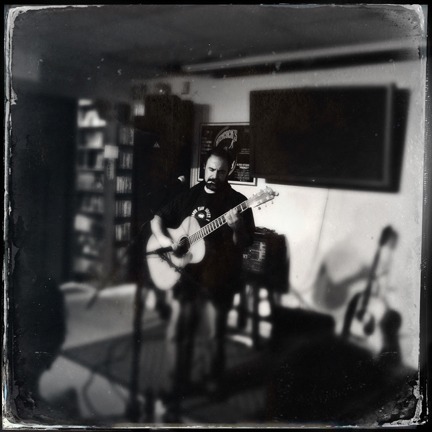 Guitarist Shawn Persinger—Shawn Persinger is Prester John—plays a solo show at Best Video this Friday, Mar. 11. The music starts at 8 PM and the cover is $5. 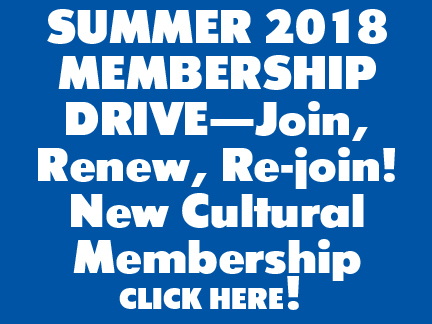 With a unique blend of acoustic folk, jazz, pop, classical, bluegrass, humor, and the avant-garde, New Haven, Shawn Persinger is Prester John has a sound that is entirely his own. 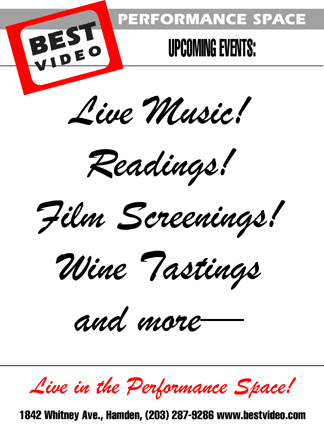 John Thomas will play in the BEST VIDEO PERFORMANCE SPACE this Wednesday, Jan. 2. The music starts at 8 PM and there is a $5 cover. John Thomas is a fingerstyle guitar player living in Hamden, in southern Connecticut. He plays instrumental acoustic music, mainly blues and ragtime. His influences range from the blues greats of the 1920s and 1930s to Merle Travis, Chet Atkins, and Jerry Reed. 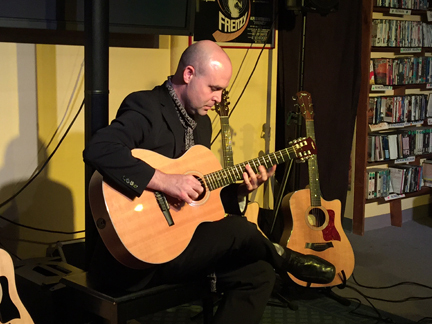 Thomas’ guitar playing is deeply steeped in American roots music of the 19th and early 20th centuries. Playing solo, acoustic music for more than 40 years, his live performances and recordings feature music that ranges from the compositions of classic blues guitarists like Blind Lemon Jefferson and Rev. Gary Davis, to the classic ragtime tunes of Scott Joplin, to the Nashville playing of Chet Atkins and Jerry Reed, and to his own original compositions that echo these influences. For many of the blues tunes and rags in his repertoire he has created original arrangements, including adapting ragtime piano pieces to the guitar.